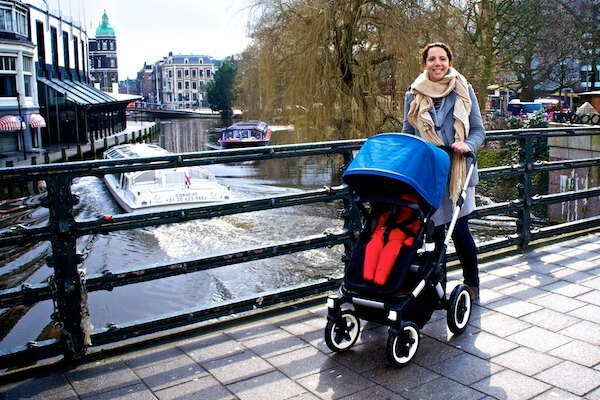 I have just returned from Amsterdam and had the chance to test drive and experience the new all-terrain Bugaboo Buffalo and can’t wait to share details with you. The Bugaboo Buffalo pram is for those who love to get outdoors with their baby, whether to the beach, out in the snow, trekking or really any outdoor adventures. This pram is very robust and more spacious than most other prams on the market. – The new tall and wide seat is built to take up to 23kg, so those with bigger or older kids can now extend the working life of their Bugaboo pram. The extra-large underbasket can hold up to a whopping 10kg and the Buffalo bag hooks are the world’s first pram to obtain a safety certificate, clearing it to hold 6kg from the handlebar. This means this extremely robust pram can hold a certified 39 kilos, so you can just imagine the strength of the frame. – The Buffalo’s sun canopy extends further to protect from the elements, which is perfect for the sun, rain or snow. – The seat has more room for shoulders which is perfect for colder months and bulky winter clothing for those older kids. – The seat is 10cm higher up from the ground than the Cameleon which means children can sit at the table with family. – One handed functionality for reversing seat and changing positions, which is already a feature of the Bugaboo Donkey. – The handlebar goes all the way down for ease of storage in the car and also is perfect for older children to push the pram (as my five and seven year old love to do). Well they’ve convinced me – a go-anywhere, anytime Bugaboo sure ticks all my boxes for my seven-month old. This is the ideal urban stroller for outdoor life. The Bugaboo Buffalo will be released in Australia this coming winter and will retail for $1549 and, for once, Australia is one of the first countries for the release of this pram which is very exciting. Of course, we’ll let you know very soon where you can get one. In the meantime, satisfy your Buffalo craving with this demo video I shot showcasing all the new features and some footage of test-driving in Amsterdam (in the snow).